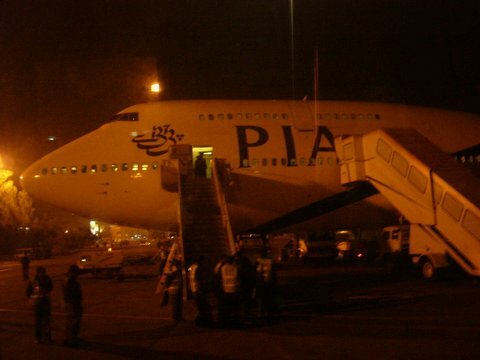 So we boarded the PIA flight to Islamabad. 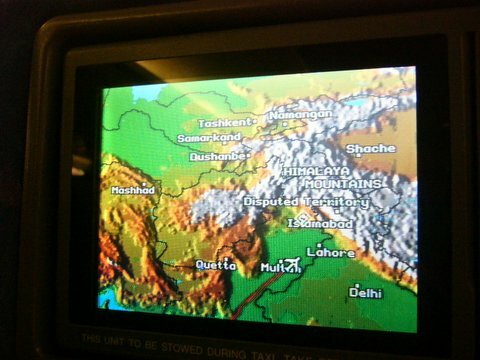 On my screen was a map and there actually was an area labelled as 'disputed territory'. Whoa. Can you spot the 'disputed territory'? 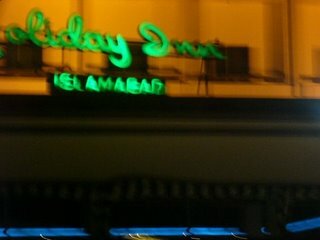 We were received at the airport by our Islamabad host Mr K. We were taken to the Holiday Inn hotel. 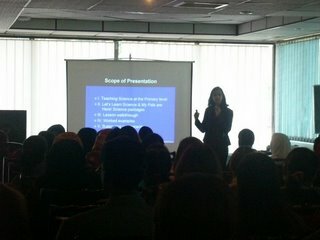 It was late and I had an early morning presentation the next day, so I crashed as soon as I reached my hotel room. 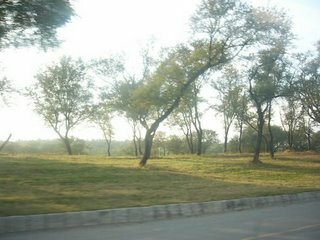 The next morning was beautifully cold and sunny, and Mr. K drove us to Hotel Pak Continental, the venue of the presentation. 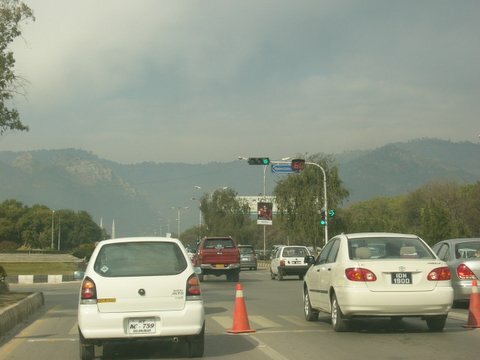 The roads in Islamabad were much wider than those in Karachi, and the roads had fewer gunmen too. On the way, Mr. K chatted with me and I discovered that he'd been in the Pakistan Naval Force for many years before switching to book publishing. I also discovered that he was NBhai's cousin, so he became KBhai for me from then on! KBhai told me that if I'd gone there a month later, I could have seen snow on these mountains! 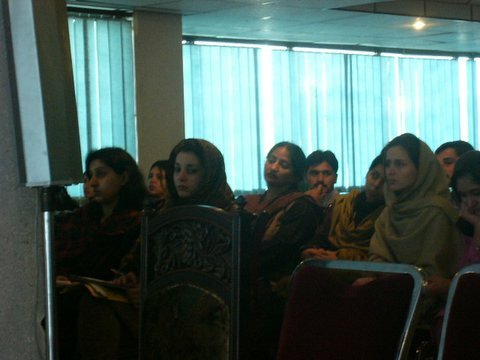 By the time we reached the venue, it was about half full. 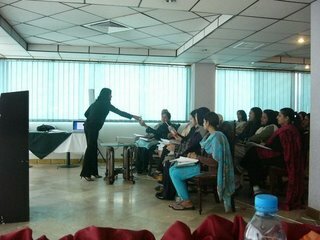 It was a smaller room than the one in Karachi because we were only expecting about 70 teachers. 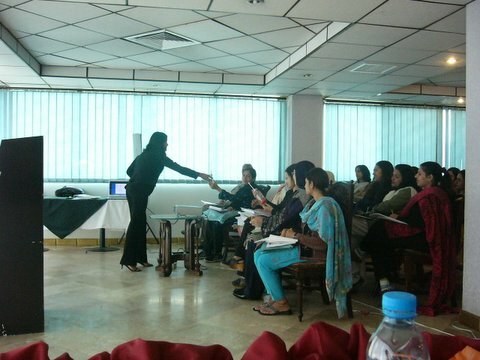 In Karachi, there wasn't a single male teacher in the audience, but here there were about four of them. The presentation went better than the one at Karachi, and my model of the respiratory system (those who have read my posts on Manila would remember it - it's a model of the respiratory system made of a plastic water bottle, a straw, a rubber band and two balloons - something I use in my Science presentations) was a big hit. In Karachi, the model I made during the presentation did not work at first, possibly due to a hole in the balloon that was supposed to represent the lung, but luckily I had a back-up. Of course my Sales Manager kept making bad jokes about how "Sayesha's respiratory system did not work in Karachi because her lung was punctured." Sheesh. Soon my presentation was over and I had some time to chill before I was due to report to the police station at Islamabad. 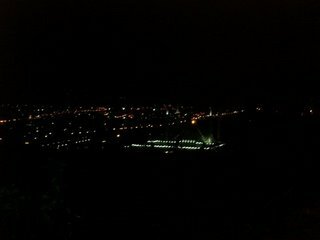 So I stepped out for a while. The sun felt most glorious on my skin - whatever was exposed of it anyway. I whiled away my time taking pictures of these birds that were roaming the hotel lawns. 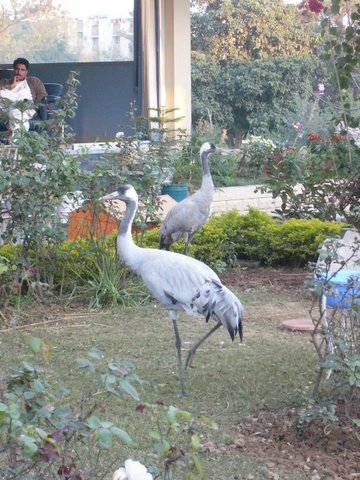 The funniest thing is - I asked everyone around me but no one had any idea what birds these were. Suggestions included ostrich, emu and even turkey! Hahahaha! 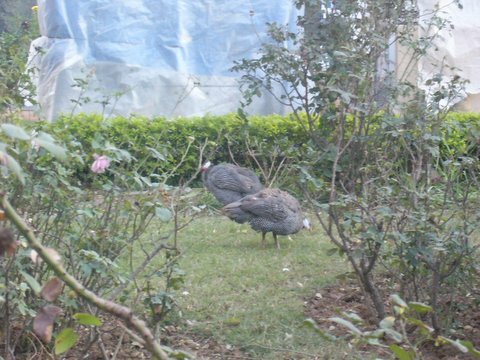 Finally we concluded that they were "from the peacock family". And more celebrities! 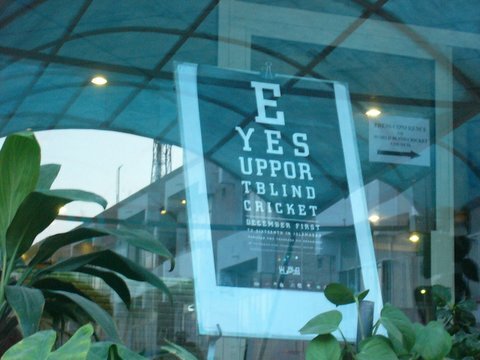 The international blind cricket tournament was on in Pakistan and many of the players were staying in the hotel. Finally KBhai took me to the police station to get me registered. This time, it was super fast and within ten minutes we were done. I was back at the venue and joined "the boys" at the book display. The Islamabad crowd was friendlier than the Karachi crowd. A lot of teachers came to thank me for the new ideas on teaching Science to primary school kids, and I almost ran out of my business cards (I had taken one box with me). "Waise India wale Singapore mein kya kar rahe hain?" ("Well, what is an Indian doing in Singapore?") She asked mischievously. I found her reply so adorable I almost hugged her! Another teacher came and told me how cool it was that I was an engineer who had switched fields to kids' book publishing. Her daughter wanted to be an engineer too, but she said parents in Pakistan preferred their daughters to become doctors or teachers. Engineering was still a man's field. After the day's event, we had some time before we were supposed to have dinner with "the boys". So KBhai drove us around the city. 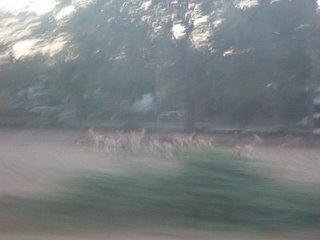 We saw deer on the way! I totally totally LOVE this picture I took from the speeding car! 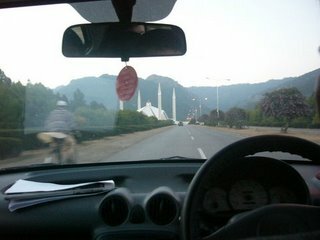 KBhai took us to Faisal Masjid, one of the landmarks of Islamabad. 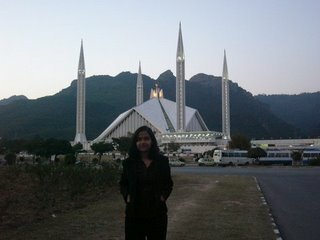 And there it is, the most beautiful mosque I had ever seen, set against the most beautiful backdrop I encountered in Pakistan! 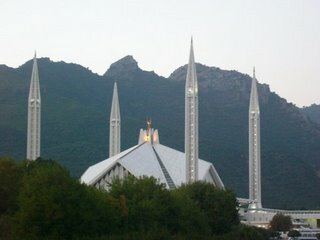 A closer view of the mosque that is said to be so big it can house 100000 people! 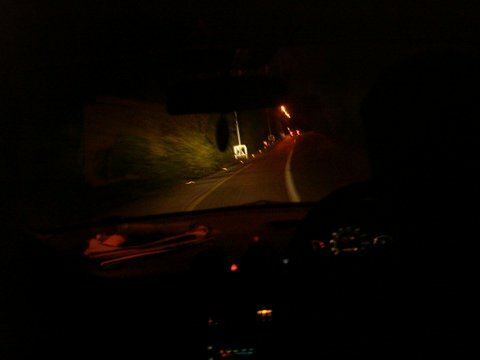 "Should I stop the car? Do you want to take pictures?" Asked KBhai. He stopped and I hopped out. Almost instantly I hopped right back in. I quickly gathered my jacket and courage, and stepped out again, this time more determined than before. I try to smile between chattering teeth as KBhai takes this picture. Next he took us to this market so I could buy stuff for my family, friends and colleagues. As he parked and we got out of the car, this dude in a swanky sportscar parked right next to us. While everyone turned to admire the car, I turned to admire the super-duper-hunk-ilicious occupant of the car. If I were to describe him, a cross between Imran Khan and Wasim Akram is what he looked like. Now you know. He even had the Pakistan cricket cap in his car. Loaded with attitude, he waited in his car. A few passers-by gave him curious stares by which time I was sure it was a celebrity. Thing is - I have kinda lost touch with cricket and could not identify him. "Darn! I don't know who he is, but he is obviously a big shot." I said. "Go, talk to him, get his autograph, take a picture with him!" said my Manager. "I don't even recognise him!" I protested. "Go take a closer look!" "Go tap on his window shield and ask him a question!" "Ask him a question? Like what??" "Like "Excuse me, is this Islamabad?"" He answered. Anyway, we moved on to the market, and discovered this really cool shop called 'The basement' which literally was a basement full of the coolest traditional stuff one can imagine. 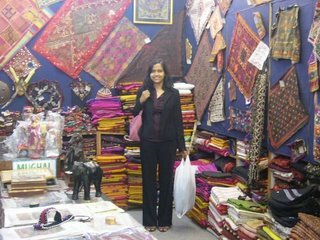 Carpets, bedcovers, rugs, bags, purses, cushion covers, wall hangers, wooden sculptures, you name it, they had it. I found the most beautiful traditional bags with mirrorwork for my female colleagues and started picking the colours. With my arms full, I walked towards the counter. "Errr... Sayesha, how many bags are you actually holding?" asked KBhai. "Inko achha wala discount dijiye. Yeh toh yahin ki hain!" KBhai told the shopkeeper. "Naah... Yahan ki toh nahin hain." The shopkeeper smiled mischievously. "Naah... kahan ki ho aap?" He asked. Ok I can't lie under pressure. "Fark? Kya fark hai? Aap batao? Ek hi toh baat hai." I said. "Ek baat kaise hai? Fark toh hai." "Kya fark hai? Aap batao na. Ek hi baat hai." "Aap khud sochkar dekhiye, ek hi baat hai." And to my surprise, he actually pondered for a while before replying. "Hmmm... waise baat toh ek hi hai." Wow, I can't believe that I won the debate purely by persistence. And oh, I got a pretty good discount. 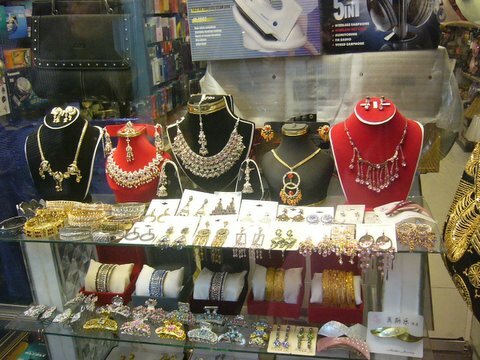 Pakistan is full of very beautiful imitation jewellery. Since I hate gold jewellery, I was in a paradise of my own. I bought some jewellery for myself which I discovered later was too heavy to be worn for more than 4-5 hours. But who cared - they're gorgeous! We also went to a dolls shop as my sister had asked me to buy a traditional Pakistani doll for her. Our salesman was a little boy about 12 years old or so. I picked a little doll I liked and asked him how much it cost. I decided to use a phrase that I'd seen NBhai use a lot whenever he took us shopping. "Mere saath foreigners ko dekhkar daam badh gaye tumhare, huh?" "Nahin! Main toh foreigner dekhkar aath sau batata hoon. Aap yahan ki ho isliye paanch sau pachaas bataya!" Gosh, that was utterly adorable. However, someone had once told me that sometimes you have to bargain just to avoid the fella saying "Sucker!" in his head as you walk outta the shop. I managed to get the doll for 450 rupees. We still had an hour or so before we were due for dinner, so KBhai said he would drive us to the top of the Margalla hills, another landmark of Islamabad. We had to walk for a distance before we reached the top which offered the view of Islamabad. 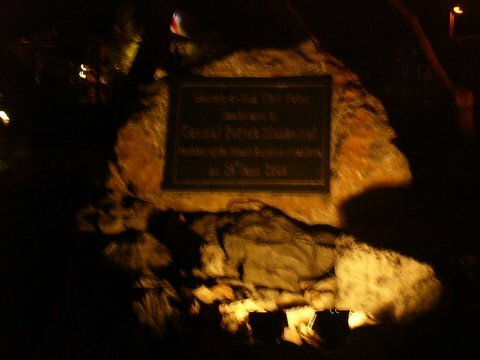 The path was dimly lighted with lamps, and instrumental Bollywood songs were playing. The signboard is supposed to say something about who inaugurated the hills, but both the photo and my memory turned out to be shaky. 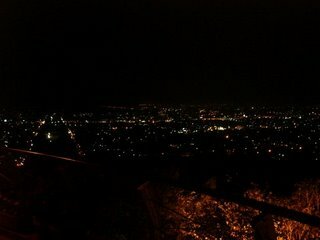 View from the top of the Margalla hills. 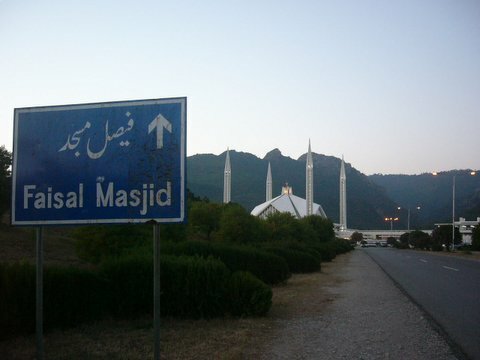 Illuminated at the centre is the Faisal Masjid. They even had a little cafe atop the hills. I hate using flash when clicking pictures, which is why you can barely see me in this picture. 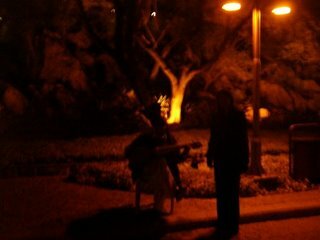 This guy was dressed in traditional clothes and was sitting there in the cold playing a stringed instrument. The sillhouette on the right is me. 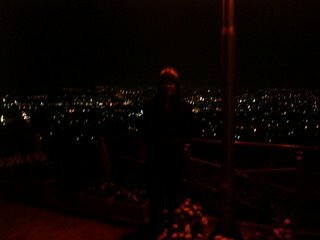 The night was getting colder and colder, and the only time I took my hands out of my gloves was to sms a friend I was missing. KBhai had also scared my Sales Manager by telling him about the leopard that was discovered in the hills last year. It was in this trip that I discovered how very comical my Manager was. "Sayesha, if a leopard appears now, what should I do? Should I climb a tree? Can it climb after me?" "So should I run? Will it run after me?" "So what should I do??? This is scary, man!" "There is no leopard!" I said. "But what if there is? What if it appears?" "Well, you just back away from it very slowly." "Really? It will spare me if I do that?" "Hmmm... maybe we should go back?" He turned to ask KBhai, much to my amusement. KBhai agreed, and soon we were in a Thai restaurant at the Marriott hotel. The hotel was holding a convention for some dignitaries from Iraq and the security was so tight it was scary. Our purses were put through the x-ray machine and even we had to pass through the security door. 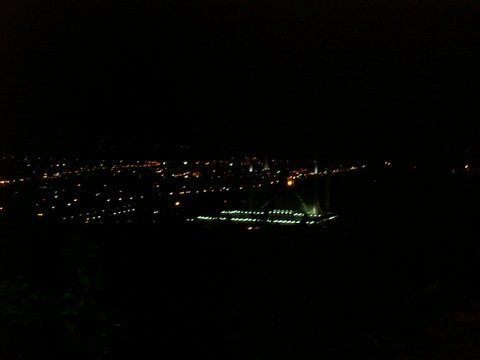 Finally, we settled down, looking forward to some hot Thai food on that cold winter night. The restaurant had imported an ultra-talented Thai chick who performed a Thai dance first, and then played a beautiful musical piece on the zipher. The menu card indicated degree of hotness by using pictures of elephants. Three elephants indicated that the dish was hot, and five indicated 'very hot'. My Sales Manager and I are fond of hot food so we ordered a five-elephant dish. We were quite disappointed when the food turned out to be only mildly hot. "Is it hot enough for you?" NBhai asked my Manager. "Not really. Three elephants maybe." My Manager answered. "Three baby elephants." I answered. I noticed "the boys" trying to stifle their laughter and smiling politely. 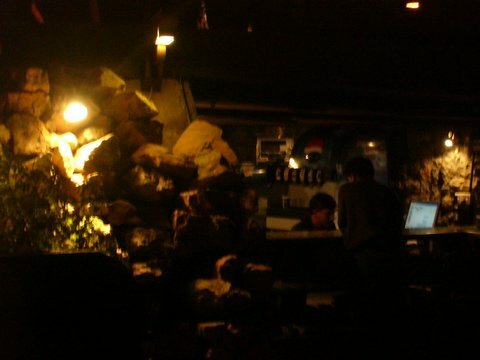 After dinner, we waited outside the hotel while KBhai went to fetch the car. The car was apparently parked a long way off, and within minutes we were freezing. Every time we thought of going back inside the hotel and waiting there, someone would say, "He should be here any moment. No point going inside now." and we would freeze some more. NBhai and the boys shuffled around restlessly for a while, and it looked like they were really cold. Unlike me, they did not have an overcoat. Finally NBhai said, "You have to pardon me, Sayesha. I just HAVE to smoke. It's just too cold. I really hope you don't mind." "It's ok, please go ahead." I said. Seeing their boss smoke, the shivering "boys" gathered courage too. And flick-flick-flick-flick - four cigarettes materialised out of nowhere. The boys looked really sheepish and embarrassed as they smoked in front of me, and kept looking at me to see if I disapproved. And that was their first informal behaviour. Though I don't like people smoking around me, I realised it had made them open up and finally smile naturally. This is really interesting. Waiting for the next part. "Passing my respiratory system around for the teachers to check it out..."
Nice travel blog - thankfully I'm done reading before my night-out this time :). I went "whoaa" on reading about the Rs. 450 doll. Then I realized the currency was Pakistani Rupee, not Indian and checked out the conversion rate - 0.7 INR to a PKR, pricing the doll at Rs. 315. And so I went "whoaa" again! hee hee! G O D ho sayesha aap! mera pranam sweekar kar mujhe dhanya karein! Wow, you sure had a nice time! Sayesha, the story teller! You are making me feel so jealous!! hi, gr8 work gal. ur post grab all my attention . u nicely narrate ur whole trip so well... nd the pic add the spice to the whole matteriale. neways u have a reader waiting 4 the next post. That was a loooong post but was worth the read! So interesting... and am so curious to travel there too! Absolutely loved the pics! Sash, I am so proud of you. I am so happy you got to go. Thought I'd drop in to say hi to you, and realized..wow, we have pictures here from Sash's trip already! Wow. Really enjoyed reading this. Aur bhi baaki hai I know! :-). 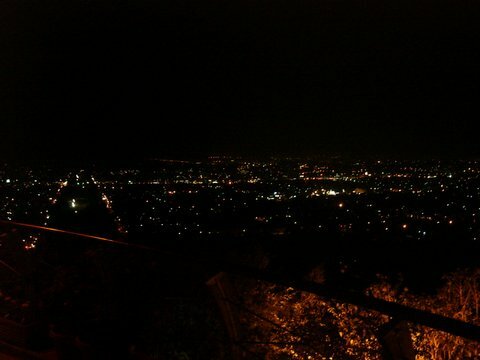 I saw a little bit of Islamabad with you. Keep it up! :-) I wish you many exciting journeys ahead :-). And it's amazing that you are getting to share your knowledge like this in different countries, with people who might really need it. It's huge. It warms my heart. Wish you a Very Happy Holiday Season :-). Thanks! :) And I do have photos of me on this blog! 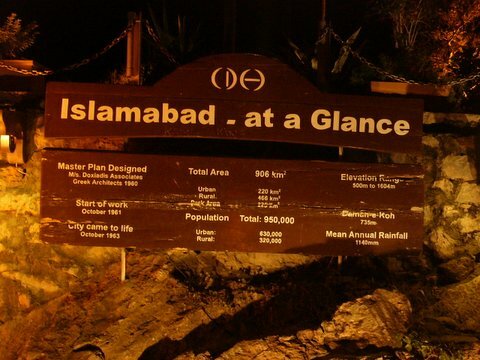 There are thousands of beauty attractions in Pakistan which are still unexplored i suggest every tourists to get flights to Islamabad from Heathrow to get access to the areas which are famous all over the world due to its natural beauty.